Anybody who has spoken to me in person over the last couple of weeks has been subjected to my enthusiasm for Dogecoin. Dogecoin (wikipedia) is a new (and the best!) cryptocurrency on the web. It’s so new that “the halving” is happening this week. Dogecoin is like Bitcoin but more internety. Because it started as a joke the cryptocurrency gained more traction and has become the fastest growing Bitcoin derivative to date. There is seemingly hundreds of cryptocurrencies that have come after the original Bitcoin. Until Dogecoin, Litecoin seemed (to me) the most promising as it looked primed to pickup where Bitcoin left off. Dogecoin changed everything. Now Dogecoin is srsbiznes. The Reddit Dogecoin community exploded in membership and influence. Because of its tongue in cheek approach to cryptocurrency it made it easier to ask questions and get help setting up one’s mining rig. Speaking from experience, the difficulty of getting into mining coins had a very steep learning curve. I wish the Dogecoin community was around when I started mining Litecoins. The use of Doge inadvertently made people not take Dogecoin seriously at the beginning and people just started throwing the currency around via tipping. They also helped get the Jamaican bobsled team to the Olympics. This caused the coin to get more interest and be registered at popular online exchanges. Presently Dogecoin is in 5th place when it comes to market capitalization. After only two months of existence! Over at Motherboard there is a great intro and more detailed history of Dogecon. The quick growth of Dogecoin speaks to the power of memes more than anything else. As a Litecoin clone, the currency’s major difference from a number of other altcoins is its marketing. According to Palmer, having a fluffy dog as a mascot is indeed the key. Furthermore, the hilarity of using a meme as the name of a cryptocurrency encourages people to both further share the meme and the knowledge of the coin. Heck, there is even a FlappyDoge game. And more Doge games are on the way! I can’t help but feel that the new aesthetic has now been brought to economics. Thus we have a confluence of hypermodernity, hyperreality, and (arguably) hypercapitalism. 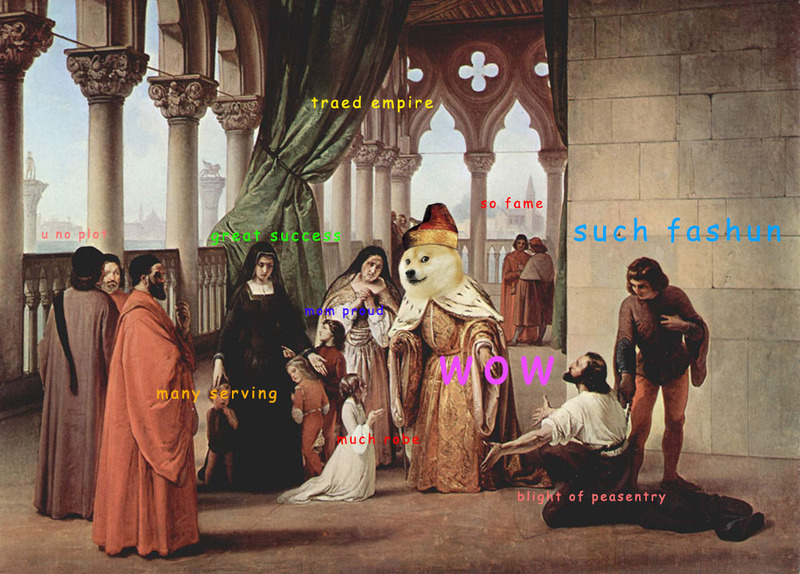 Also, because the internet is wonderful, there is already an analysis of the grammar of Doge. If you want to start mining Dogecoins this guide is handy. You’ll also need to join a mining pool, I’m at Dogepool.net.